Move over multi-family. The new darling in Virginia’s construction market is the grocery-anchored, mixed-use center. 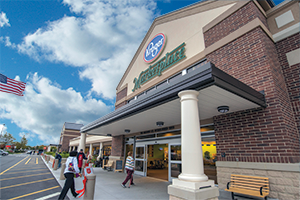 During the past year, several major grocery stores, including Kroger, Wegmans and Martin’s, have either built or announced new stores. Whole Foods, Harris Teeter, Fresh Market and Wal-Mart also are expanding their number of stores. Typically, they serve as anchor tenants in mixed-use developments that strive to create environments where people can live, work and play. Mixed-use developments are big around the state, especially in and around Tysons Corner, where the opening of the expanded Silver Line Metro last summer has sparked millions of square feet of new development. Health care is another driver in mixed-use development. Developers are including medical office buildings in centers near apartments and shopping like the $50 million, 160,000-square-foot Short Pump Medical Center complex that’s going up in Henrico County. There’s also a surge in the building of assisted-living communities, rehabilitation centers and nursing homes, driven by the aging baby-boomer demographic. Throw in hotel projects under construction such as the $126 million, public/private, hotel/conference center in downtown Norfolk, and it’s easy to understand why contractors expressed a sense of optimism during a recent survey by the Associated General Contractors of America (AGC), an Arlington-based trade group. It found that 80 percent of the U.S. construction firms that were polled planned to expand their payrolls this year, with Virginia reporting more expansion plans than any other state. The construction industry also is keeping an eye on large energy infrastructure projects. If a federal agency approves a new 550-mile natural gas pipeline that would come through Virginia, the $5 billion project would create hundreds of construction jobs. While work hasn’t returned to pre-recession levels, the overall mood is brighter than it has been in years.